Oversized purple paisley wallpaper and orange accessories lighten up the teen boys playroom which is dominated with comfy graphite furniture and musical instruments. 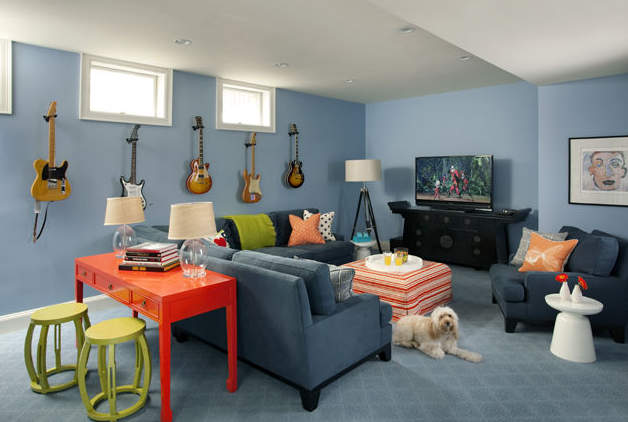 Another music/hang out room for a family. Again she uses orange as a pop of unexpected color, this time paired with chartuese stools from Bungalow 5. The fish pillow is by Thomas Paul and the white martini side table is from West Elm. Especially when decorating children's spaces, it is important to mix high and low pieces since the rooms will be used and played in daily. More unexpected feminine wallpaper in a play space. This time it is floral. 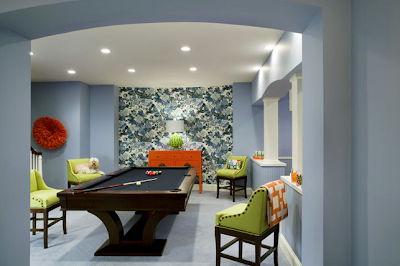 LOVE the upholstered bar chairs used as extra pool table seating. Wonder if they are leather for fabric? Two more traditional children's room designs but the use of wallpaper sets them apart from your standard room. See friends, do not be afraid of wallpaper! Simple stripes in the boys room, and a sophisticated chinoiserie print in the girls make them timeless. 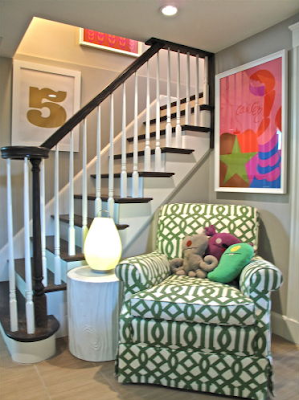 The striped balloon window treatments in the girl's room paired with the Stray Dog Designs white octopus chandelier are wonderful playful combination. 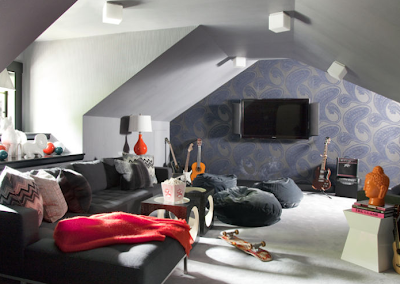 Another hang out room (probably an old playroom turned into a tween tv room). 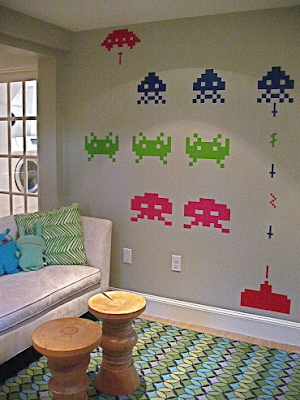 Removable Blik asteroid decals adorn the wall and a graphic rug on the floor with a few accent pillows are all you need to inexpensively funk up the room. I can't really tell where this space is, my guess is since Liz is back east is in a basement, but it could be in a hallway entrance since the chair is upholstered in the definitely not cheap Imperial Trellis fabric. But the framed posters lining the stairs are a simple artwork treatment that anyone can do, have fun making it your own by finding vendors on Etsy. A boy's bedroom with plenty of play space. To close in a large room like this, she used dark paint on the walls and a stripe carpet. A solid carpet would have been too boring. 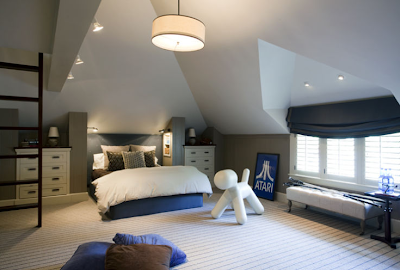 Another boy's room, this one is much more sophisticated and could pass for a guest room. Almost looks like room which was re-decorated after the son went to college. Still comfortable for him to come home to yet suitable for out of town visitors. Graphite again, this time with a splash of yellow. Enjoy! I recommend looking through the rest of her site too! Look at this garage-turned-office, a successful transformation! I'm looking forward to the birth of my first Grandson in September, so I'm loving all these boy bedrooms...great inspiration! !